Christian Flynn: Power is Born Here. Published 23 January 2014 Simon Marsh. What one is immediately struck by when viewing the work of Christian Flynn is the supersensual aesthetic celebration of colour and form. The sheer potency of this dynamic aesthetic is none other than an exuberant, intelligible reconfirmation that the layering of paint on canvas maintains its position as an indispensable artistic process. Flynn’s comprehensive redefinition of what we as an audience actually expect to see when viewing a post-modern work of art, in an age saturated with digitised simulacra, verges on the gloriously unimaginable. 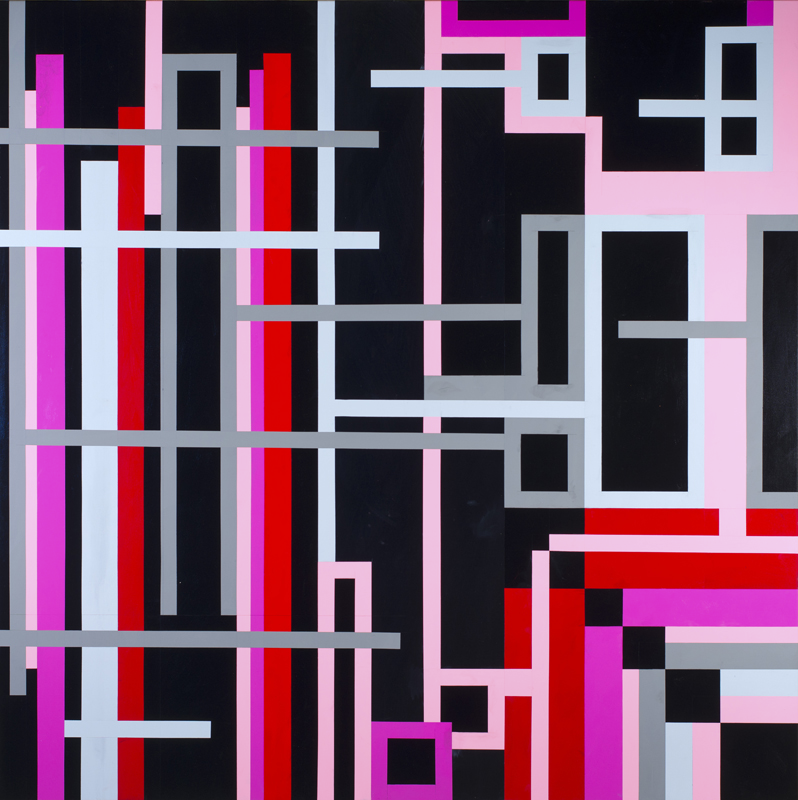 Exhibiting at the Hughes gallery, Surry Hills, from 23 January through to the 18 February 2014, Flynn’s Power is Born Here, has a distinct capacity to realign our notion of what art has become. Securing his course work masters with first class honours from the Queensland College of Art in 2007, Flynn has consistently been showing his seminal brand of post-modernism over the past decade. Including, though not limited to, galleries such as Soapbox, I.M.A, Ryan Renshaw, George Petelin and Ray Hughes, from the outset, his earlier efforts have clearly informed his more mature developments as an artist. This coherent commitment to exploring in depth a post-modern trajectory is in itself, testament to establishing an artistic output in an overloaded marketplace. Reading through the scant literature surrounding the works of Flynn one often feels that there is something missing, namely, an historical, artistic meta-narrative that clearly maps, informs and shapes his practice. For when looking at his output over the past decade we get a clear sense that Flynn’s oeuvre extols an accessible, unambiguous pastiche of certain artistic fundamentals evident throughout Modernism. However before framing these formal elements of Flynn’s practice lets refresh and evaluate what exactly constitutes post-modernism in art. As we have seen repeatedly throughout the history of art, stylistic changes are often fraught with accusations and counter accusations until the changing of the guard settles into a rhythm that could be said to be synonymous with the spirit of the times and this is precisely what post-modernism did. Suffice it to say the term post-modernism in art gained a solid academic currency in 1984 with the work of literary critic Frederic Jameson. However, Charles Jencks, Jean-Francois Lyotard and Ihab Hassan, had all been circling the concept from the mid to late 1970’s. It must be said though that the writings of Hassan have been roundly criticized for promoting crude oppositions that were far from watertight. 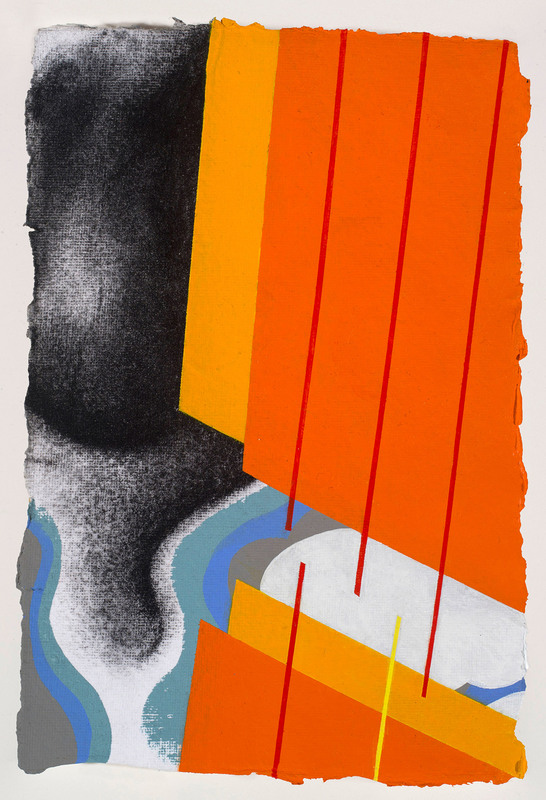 Gaining prevalence then from the early to mid 1980’s, post-modernism, essentially an academic idiom, has been applied retrospectively to artists and movements within the canon as far back as Frank Stella who is arguably seen as the last of the Greenbergian Modernist painters. It was Andy Warhol who first understood and exploited the collision of art and commercialism. He simply refused to ‘traffic in the idea that art and commerce were in any way mutually exclusive.’  He seized upon the mass production, mass marketing and mass media that became a pervasively inescapable part of post war industrial America. His appropriations of common consumer goods such as Campbell soup cans certainly affirm the commercial culture of art entering the marketplace. We as viewers simply consume these items and if in the market, purchase them. Warhol’s supermarket aesthetic simply refuses a preference for or understanding of an object outside of its serialized commercial nature. The serialized nature of the work in effect suggests that the viewer must simply execute a choice based on a personal taste or feeling. Warhol cleverly toyed with these notions of taste and feeling which both played an important role throughout Modernism. Warhol provides us with a brilliantly playful though also caustic and ironic deconstruction of the Modern epoch. All that remains then in post-modernism is for artists to combine and recombine – in ways that maintain meaning – fragments of whatever medium the artist works with. Post-modernism and indeed post-modern culture is therefore seen as a culture of quotation. A culture obsessed with re-framing and re-contextualisation, one of ‘copying, pastiche, ironic reference, imitation and duplication.’  Post-modernism unabashedly negated many traditions throughout the artistic canon, it radically redefined what we as an audience actually expect to see when viewing a post-modern artwork and has redefined our notion of what art actually is. For me paintings are objects first, not surrogates for other things. Even though they do stand in for non-material things such as ideas. It is a balance between the two and I try to balance my subject matter with the presence of the object. The flattening out and reduction of the picture plain is something I’m interested in exploring more. This in no way suggests that these fundamental elements of post-modernism are a negative that can only possibly lead toward a drawn out death of art. In fact it simply denotes change. 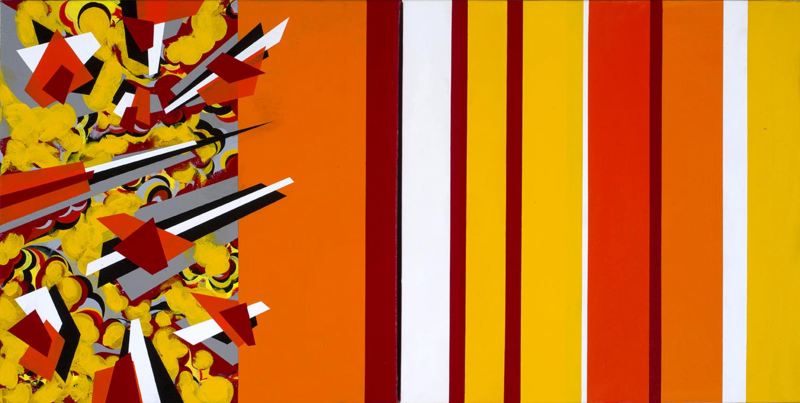 And as is the case with Christian Flynn, if the finished product is intelligibly executed with an accomplished technique, pops with a dedicated comprehension of what formal elements are cherry picked and re-contextualised, if the work shows intent and can be seen to be seeking answers, or indeed posing questions in paint on canvas from an informed inquiry – irregardless of irony – then the artistic process sits comfortably alongside the artistic object. So what are the formal elements of Flynn’s practice that denote a heightened form of post-modernity? For me paintings are objects first, not surrogates for other things. Even though they do stand in for non-material things such as ideas. It is a balance between the two and I try to balance my subject matter with the presence of the object . The flattening out and reduction of the picture plain is something I’m interested in exploring more. 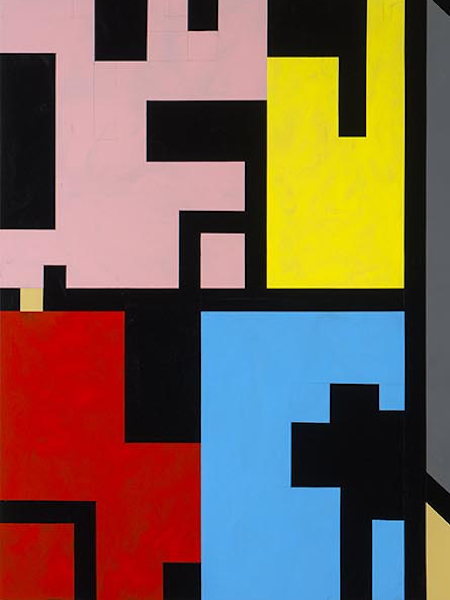 Riffing off an informed platform of polished improvisational painterly techniques, from his earliest efforts we can clearly see Flynn’s fascination with the hard-edged geometric abstraction and temporal verticality of suprematism that as a movement, intimates the possibility of achieving a heightened consciousness. And whilst suprematism undoubtedly privileged concept over aesthetic affect, it importantly conspired to open up the Modernist imagination. Fusing this with the formal sculptural language of constructivism that privileges the expression of a perceived sensation of things as they are, as opposed to what we inherently know them to be – in essence, to make known objects unfamiliar – is in fact one of the areas where Flynn excels. When we look at, for example, Conclusions and Implications, we can begin to appreciate that this re-wrapping and juxtaposition of familiar Modernist elements on the same picture plane, creates an initial contrasting unfamiliarity before the rational mind can in fact reconfigure the re-contextualised unfamiliar toward an understanding of what is inherently known as the familiar. 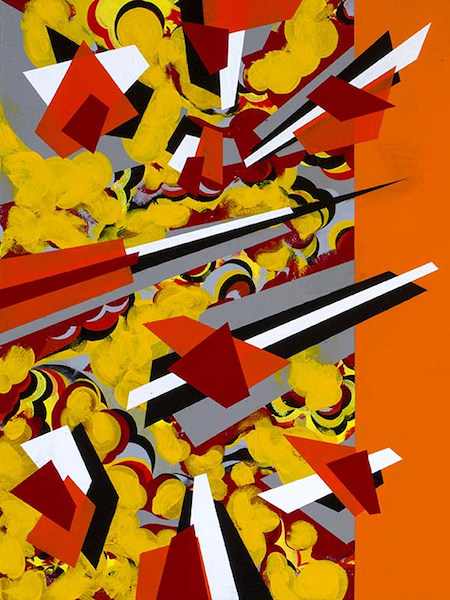 Futurism’s glorification of the dynamism and violence of a modern technological society, exhibiting both the horizontal and vertical push and pull on the eye in essentially celebrating the perceived over-stimulation of the modern individual’s sensorium, is unmistakably felt in works such as Action Time. Modernist Piet Mondrian’s reliance on line and colour in achieving his vision of the total realisation of beauty is expressly evidenced in Now Is The Time For Sincere Regret and Apology and more recently the ‘all over’ formlessness of Jackson Pollock’s brand of abstract expressionism. Not only this, but interestingly, the figurative verticality and horizontal movement of Pollock’s poles – traditionally buried behind a mass of drips – are bought to the fore and seamlessly move across a ground of receding colour and shapes that otherwise dominate the canvas. 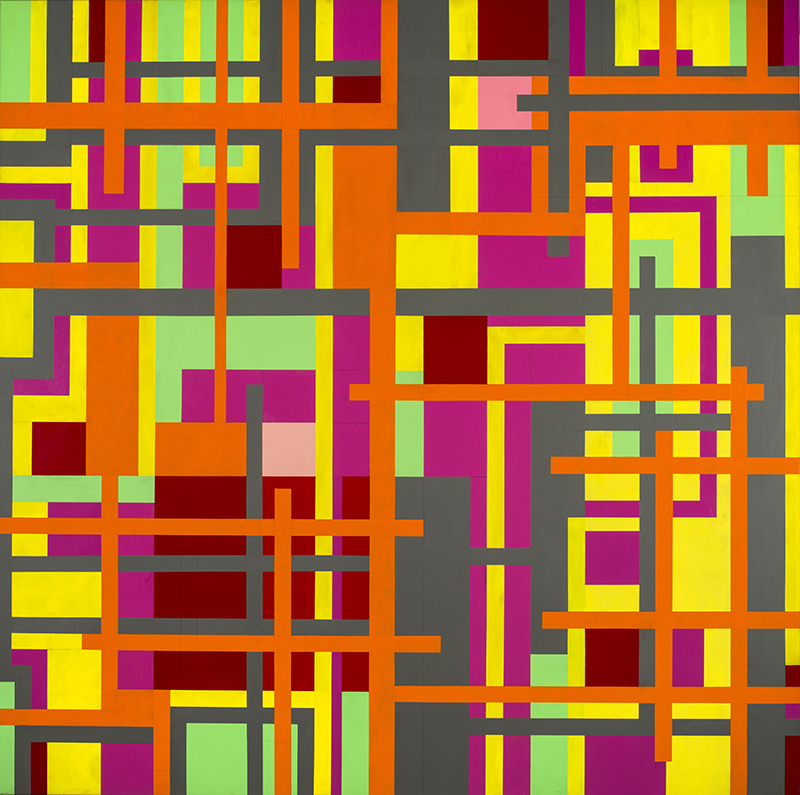 This is exquisitely intimated in works such as The Struggle With An and Geometry Density Saturation and again in the series Unification Theory. 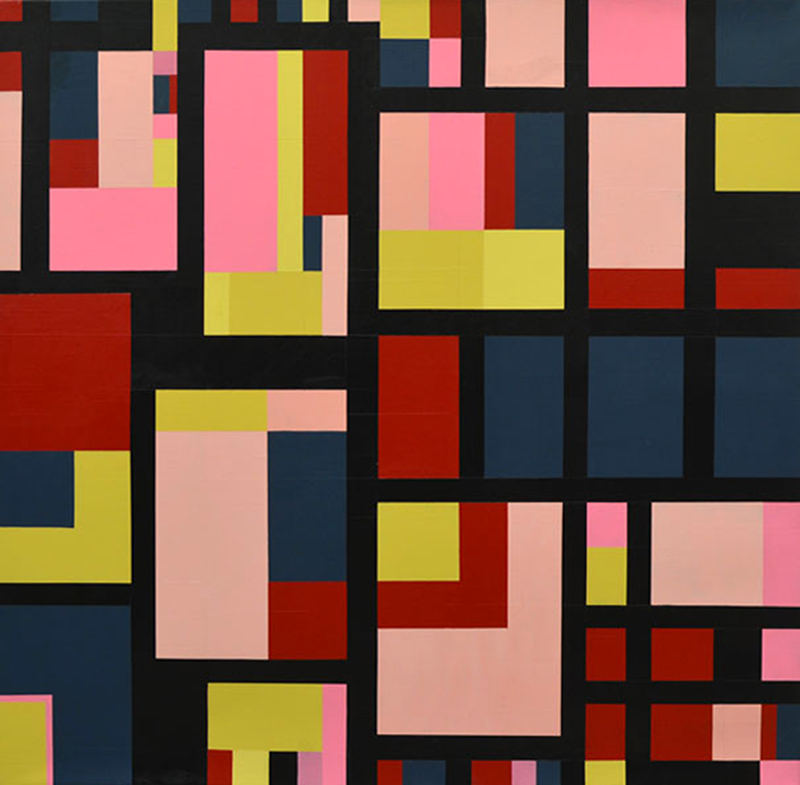 The visual conversation of Organation, between Flynn’s post-modern appraisal and the colour-fields of Barnett Newman being encroached by an intimation of Mondrian’s unencumbered beauty, clearly lends an understanding of the artistic complexity at play, an understanding of the subtle depth of artistic conversation we are engaging with. Marry this wealth of formal quality with Flynn’s ongoing fascination with Japanese anime, origami, science fiction and the ABC tele-visual test pattern and we can begin to comprehend the sheer density of the visual language that Flynn invites us to entertain when viewing his oeuvre. 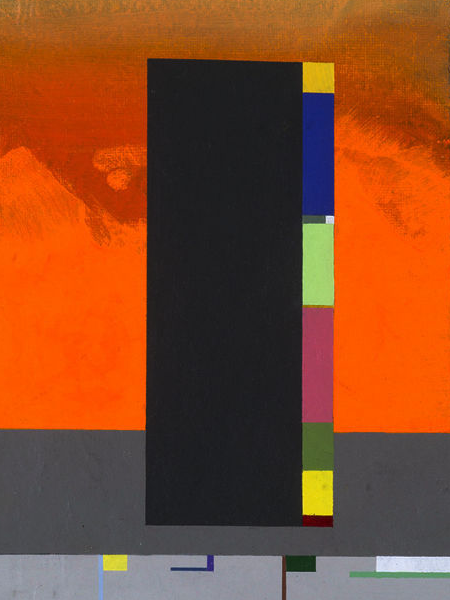 When looking at the ten-year professional artistic output of Flynn, we get a distinct impression he has systematically been resolving perceived problems that have arisen out of an artistic inquiry into the Modernist epoch. Reframing these concerns – whilst exploring ‘polarities such as authority, weakness, indeterminacy, certainty, seriousness, humour, rage and joy’- firstly in a spirit of understanding and secondly to satisfy some form of ironic commentary that seemingly drives his inspired output, as with most things, the more he understands, the more artistically complex his woks become. 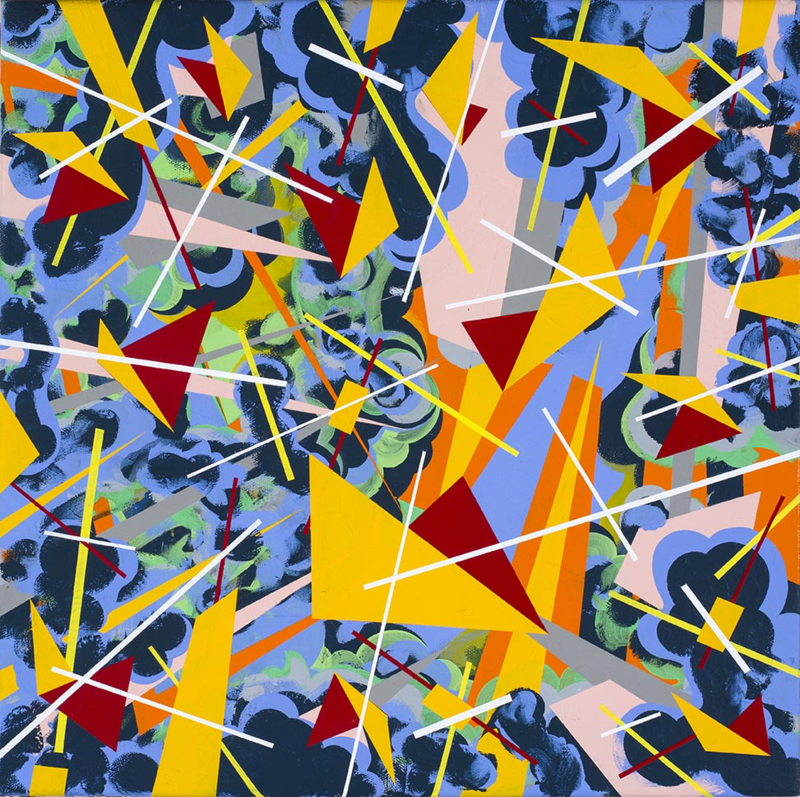 The sheer potency of size of the majority of these canvas’ speaks to just how adept Flynn has become with his compositional prowess. 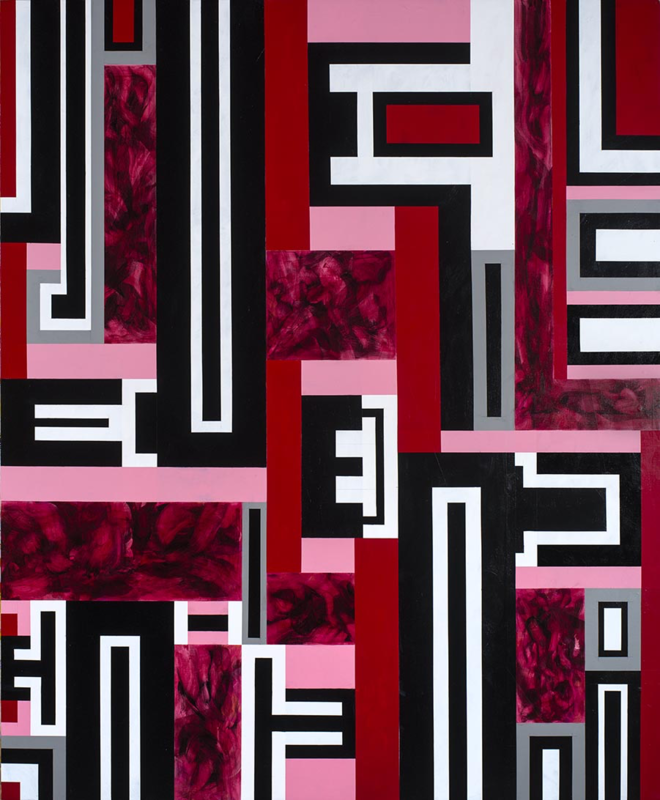 An expressionistic, post-modern tour de force, the artwork of Christian Flynn leaks a contemporary abstraction that simply demands an aesthetically charged visual response from the viewer. Header image courtesy Christian Flynn, Communicative Obelisk, acrylic on paper, 24 x 15cm, 2016. Music Courtesy: Per Olov Kindgren, Adagio, Tomaso Albinoni. Hopkins, David. After Modern Art, 2000. Hopkins follows Frederick Jameson’s assertion that “aesthetic and commodity production has become indistinguishable – technologies of reproduction such as the television have replaced technologies of production”. Shusterman, Richard. The Journal of Aesthetics and Art Criticism, 1992. Gillespie, Nick. Andy Warhol’s Ironic Achievement, 2006. MacMillan, Kyle. Selling the Concept of Art as Commodity: Provocative Installation Explores Commercialism, 2010. [5 Archer, Michael. Art Since 1960, 1997. Art Almanac. Special Moves at MOP Projects, Sydney, 2013. 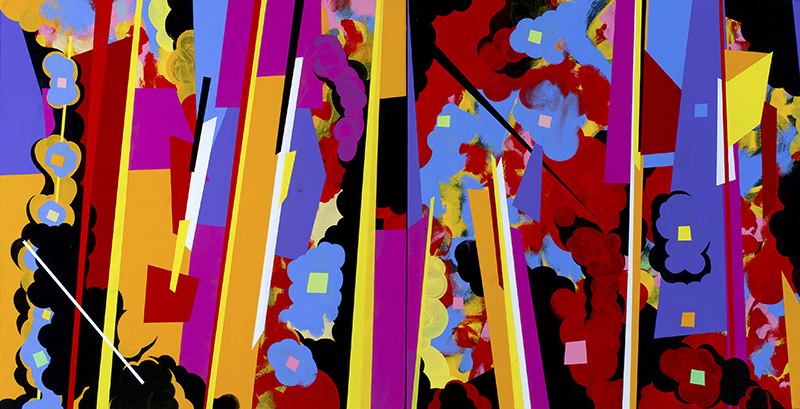 Image: detail, Residual Math, synthetic polymer paint on canvas, 2013, 51x102x4cm. All images © the artist. All text © the author. Header image: Communicative Obelisk, acrylic on paper, 24 x 15cm, 2016. 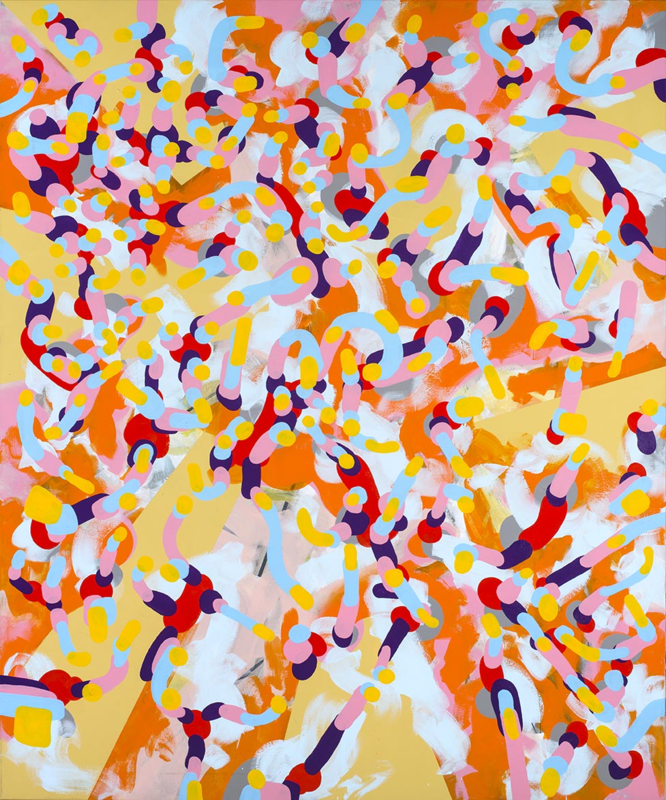 Image: detail The Future Of Discipline, synthetic polymer paint on linen, 2013, 92.5x239x2cm. View the most recent solo exhibition of Christian Flynn, Within the Realm of a Dying Sun, Heiser Gallery, Fortitude Valley. Image: detail, Communicative Obelisk, acrylic on paper, 24x15cm, 2016. You can view Christian Flynn talking about his work and inspirations by navigating to our media index page.